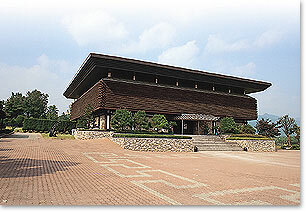 Haegang Ceramic Museum is devoted to researching and exhibiting Korean ceramics. Haegang Pottery Art Gallery is devoted to researching and exhibiting Korean ceramics. The museum was built by the founder of Haegang Ceramics, Yu Kun-Hyung, who spent his entire life researching ancient ceramic production centers and collecting ceramics, in order to rediscover the secrets of Koryo celadon production. It was first opened in 1990. On the first floor, there is a Ceramic Culture Room which helps visitors understand the history of ceramic art in Korea. Historical documents and visual aids demonstrate the various processes used to create the various types of porcelain. Haegang's own masterpieces are on display in the Haegang Memorial room. the 9th century onward. Antique ceramic artifacts such as celadon, punchung, porcelain, and other items can be found here. It offers special exhibitions throughout the year, so visitors can experience something new with every visit. Haegang Pottery Art Gallery is an important contributor to academia, researching and publishing. It also operates on-the-spot ceramic product -ion courses, in which participants can get hands-on experience with the ceramic-making process.